This clock is pictured in Ocotea Bulata or Stinkwood. 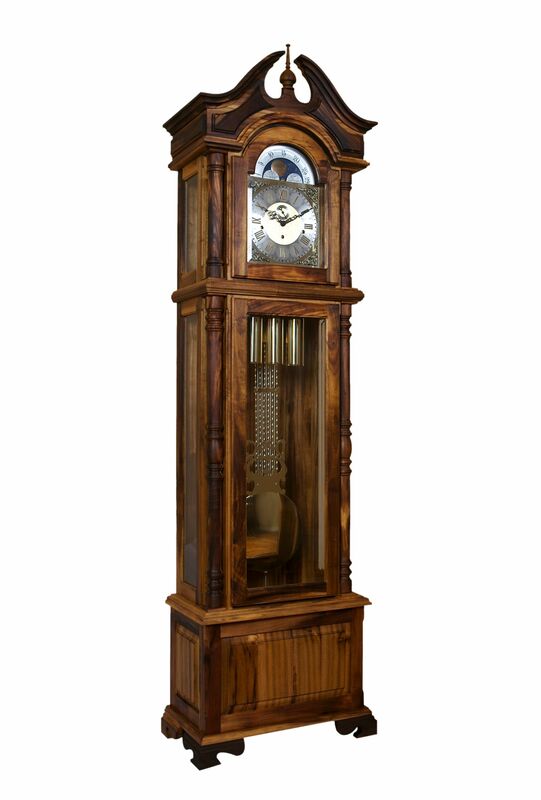 The swan neck crown is balanced by the two full rounded columns of the hood and another two on either side of the body of the clock.Andes also features solid floating side panels. The Luxus dial features the four cornices with raised borders surrounding the filigree netting, which is repeated in the center of the dial. The brass aluminium roman numerals are laid onto a brass aluminium dial ring, making for an understated luxurious dial. The Hermle cable movement plays the Westminster, Whittington, and St Michael melodies on the flagship 9 Tubular movement, and has an automatic night silencer option.